President Kennedy was assassinated in Dealey Plaza, 40 years ago. On one hand, it seems like ancient history, but on the other hand, it' as if it just happened. The Early Show co-anchor Harry Smith goes back to an America frozen in memories. CBS Evening News anchor Dan Rather says, "Nobody imagined the possibility of assassination. Nobody imagined taking a shot at the president." It began at Love Field, Dallas, Texas. John F. Kennedy spent the final hour of his life in triumph: the weather that day was clear and it was decided that the president would ride in an open car, under the glaring Texas sun. The motorcade made its way through downtown Dallas en route to a luncheon at the Trade Mart, where a sellout crowd awaited the president's arrival. On the streets, the reception was jubilant. The motorcade was proceeding through downtown on Main, makes a right hand turn on Houston and then makes a sweeping left hand turn onto Elm. The motorcade is coming right by the base of the old Texas School Book Depository, and it was on the sixth floor that Lee Harvey Oswald was believed to have been waiting. A Dallas businessman with a home camera recorded a moment that changed the world. Acting on a tip, a reporter tracked him down - using the Dallas phone book. Richard Stolley, now senior editorial advisor of Time Inc., recalls, "And I simply ran my finger down the Z's. And my God, there it was: Zapruder, comma, Abraham!" The next morning, Stolley and two Secret Service agents saw Zapruder's home movie for the first time. Stolley says, "There was nothing in God's world that would have prepared us for the sight of that head wound. And we all stood there. When the head wound came, every one of us just went, 'Uh!' I mean ,it was as if we had been simultaneously gut punched. I will never forget that sound as long as I live." On the street, Smith shows where the motorcade was when the shots were fired. Some say Oswald perched right up the building of the book depository. But others said they saw shots fired from the so-called Grassy Knoll. What is not in dispute is that President Kennedy was mortally wounded in taht square. The motorcade rushes to Parkland Hospital, and the eyes of the world turn to Dallas. CBS Newsman Dan Rather was on the motorcade route that day. Rather says, "The sense of chaos and information just flowing and it was so hard to believe that somebody had shot at the president, much less that the president had been hit, much less to believe that he was seriously injured, much less that he was dead. But this picture was forming very, very quickly." On TV, Cronkite reported, "The president was rushed to Parkland Hospital." Within minutes, the world began to hear what some in Dallas already knew. Rather says, "The big break was to get through by telephone to Parkland Hospital where I was told almost immediately by a doctor that the president was dead, which was, boy - you talk about a shock!" Forty years ago, the Parkland Hospital radiology waiting room was the operating room where President Kennedy was taken. Dr. Ron Jones was one of the first to see the president. He recalls what he saw that day, "He was not moving. His eyes were open, fixed gaze." The doctors performed a tracheotomy. They massaged the president's heart. Dr. Jones says, "Took a knife, made an incision, I could see the vein, put in a catheter and connected IV fluids to it." And Mrs. Kennedy was watching it all. Dr. Jones says, "She knew that it was probably going to be a fatal outcome, but she was very composed, and stayed in the room most of the time." It was clear that the situation was hopeless. Dr. Jones says, "He never showed any evidence of recovery." 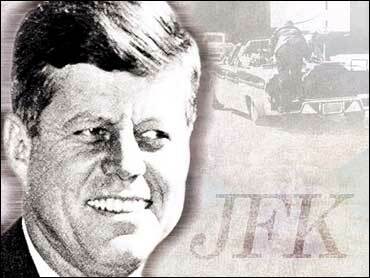 The president was declared dead at Parkland Hospital at 1 p.m. on the afternoon of Nov. 22, 1963. Cronkite read this on the network newscast: "From Dallas, Texas the flash apparently official- President Kennedy died at 1:00 p.m. Central Standard Time, 2 p.m., Eastern Standard Time, some 38 minutes ago." As the nation, and the world, descended into mourning, people witnessed some of the most enduring images in modern history: the new president being sworn in aboard Air Force One; a flag-draped coffin; the poignant dignity of a grieving widow; and the faces of people coping with a sense of innocence lost - never to be retrieved.